Hi! My name is Tara, and I've been grooming for over 10 years. A few years ago I owned and operated a successful mobile grooming company in San Diego, but I moved out of the area and sold the business. I've relocated to San Bernardino, CA, and I'm starting over with a brand new company that I couldn't be more excited about. Grooming dogs and cats is my passion. I see grooming as artistic, challenging, and fun! Who wouldn't love my job? I get to hang out with adorable animals all day and meet the best people there are - animal lovers, like me. I have a warm heart and a gentle touch, and I treat my client's pets like they were my own - with LOTS of kisses and cuddles! Tara is the only groomer I will allow to touch our little yorkie. After poor experiences at PetSmart and Petco, we found Tara. Her van is very clean, she comes to us, parks right in front of our house and our dog loves her! Our Yorkie always looks beautiful after her play dates with Tara. To top it all off, she charges less than most other grooming companies and does a much better job. But mostly- We love knowing that our dog is being treated well while getting her bath/hair cut. We have 1 American/Eskimo mix, 2 itty bitty Pomeranians, and a new Golden Doodle Puppy. We have never been able to figure out how Tara takes this crazy, out of control group of animals, and in just one afternoon she turns them into beautiful and elegant dogs! This will never cease to amaze us. We all love Tara's work. She does a wonderful and thorough job every visit! These guys are fantastic. They come to your house and take their time to do the best job possible. My cat comes out rubbing against the groomer like they are besties and you can just tell the way he struts that he feels good about himself and is ready to regain his role as Mayor of the neighborhood. Highly recommend! When I had my cat, Monkey, with me in SD visiting family, I made an appt with AAG. Tara (the groomer) was very professional and gentle with Monkey. He doesn't usually like groomers but he loved Tara! Any time I've ever brought Monkey to a groomer he always came back mad and scared. I knew he didn't enjoy those experiences. When I got him back from Animal Artistry Groomers, he was purring! He had the cutest Lion Cut and smelled great! We are a full service mobile grooming company, with everything needed to make your pet feel fantastic. We will come directly to your house, and groom your pets in your driveway or your street. You can relax knowing your pet is safe and just a few steps away. No more leaving your pet at a salon for 4-5 hours, shivering in a crate. Your beloved pet will be treated with utmost love and tenderness. We perform grooming of every style, to your specifications. 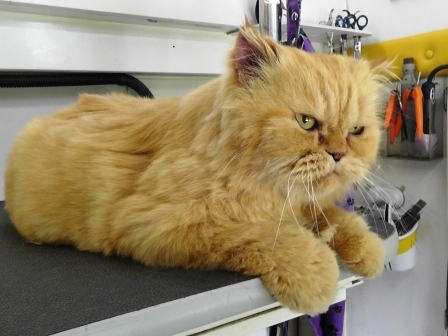 We groom all dogs of every size and temperament, and we groom cats too. Our prices are fair, and our staff is warm and friendly. Our modified Ford E350 vans are completely self contained, and we most likely will never need your water or electricity. We have water tanks for clean & dirty water, generators for power, and water heaters for warm comfy showers installed in our modern, well-stocked, state-of-the-art vans.